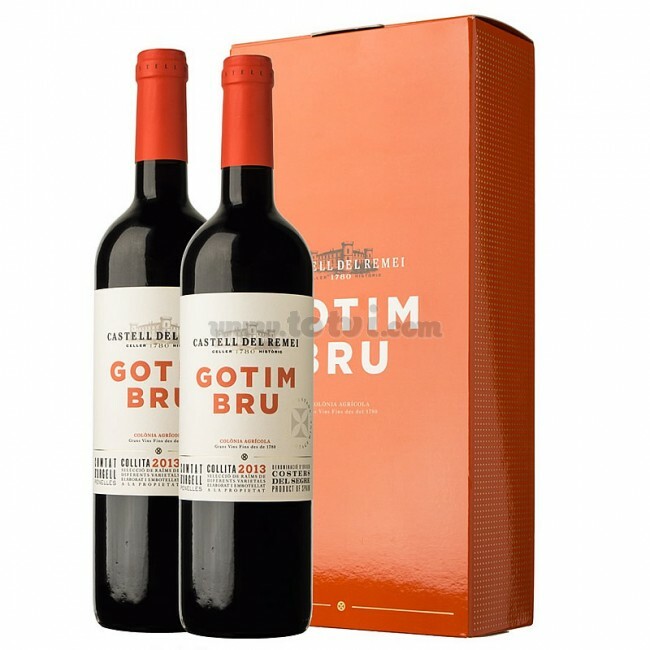 Orange cardboard carton for 2 bottles of Castell del Remei Gotim Bru, a wine coupage of Tempranillo, Garnacha, Cabernet Sauvignon, Merlot and Syrah of own vineyards from Castell del Remei. An aged wine of mineral aromas and sweet and voluptuous entry into the mouth. Orange carton case for 2 bottles Castell del Remei Gotim Bru, a Tempranillo, Garnacha, Cabernet Sauvignon, Merlot and Syrah wine from the Castell del Remei estate. Middle cherry color and garnet reflections. The tear is dense. In stop glass, great aromatic potency and complexity: notes of jam of red fruits, along with lactic and aging memories: toffé, toasts and sweet spices. Aroma appear the mineral aromas, next to the memories of pastry, coca of candied fruit and the touches of aromatic herbs, like the thyme. The mouth is sweet and voluptuous. In the passage through the mouth appear the tannins very well integrated and that fill the palate. The acidity is present during the tour and brings freshness. Very long and balanced persistence. Along the way retronasal memories of nuts and wafers. Aged for 10 months in American and French oak barrels.